Michelangelo’s David, Leonardo da Vinci’s The Last Supper, Botticelli’s The Birth of Venus— what’s your favorite masterpiece? These exquisite works of art were created by Italian masters who set a new standard of excellence in Italian craftsmanship. Inspired design, superior materials and painstaking attention to detail have since become synonymous with any products donning the coveted “Made in Italy” tag. 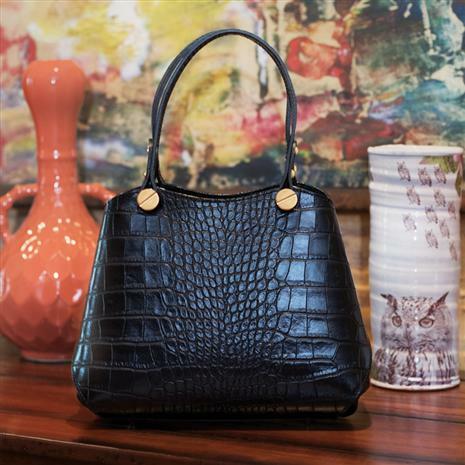 And while people travel from all over the world to marvel at the grand masterpieces of Italian artwork, Stauer’s Italian handbag collection brings their artistry a little closer to home. Our Carina Bag was designed and crafted in Pontassieve near Florence in the heart of Tuscany. Constructed of genuine croc-embossed leather with gold-finished brass hardware, it opens to a generous main compartment separated by a center divider. Shoulder strap included. With Carina, experience meets innovation— a true testimony to the flair and finesse of Italian craftsmanship.